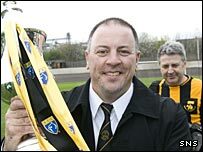 John Coughlin has resigned as manager of Berwick Rangers after just over two years at Shielfield Park. General manager Jimmy Crease will take temporary charge until a new team boss is appointed, said a statement on Berwick's website. "It is hoped to have someone in place for our next fixture versus Cowdenbeath," it added. Coughlin's announcement came after a 3-0 home defeat by Alloa Athletic left Berwick at the foot of Division Two. The Wee Rangers are equal on points with Brechin City but six points adrift of third bottom Cowdenbeath. Coughlin, who previously managed St Mirren, had led Berwick to the Third Division title and promotion in his second season in charge. But, following Saturday's defeat, he told the News of the World that he was poised to quit. "I have been asked to sleep on it and, out of courtesy, I am prepared to do that," he said. "But it will take a massive U-turn for me to change my mind. "I have already told some players I think I can take them as far I can." Coughlin, who has been linked with the vacancy at Third Division outfit Stenhousemuir, confirmed his decision on Sunday.